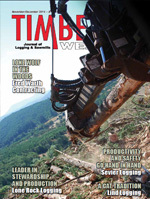 It’s Lone Rock Logging’s proactive commitment that has won them so many awards, including the Oregon Department of Forestry’s Southwest 2013 Operator of the year. Fred Warth Contracting prides itself on taking on the small jobs that others walk away from. Rawlings Manufacturing sets up a new test facility at its Spokane manufacturing center to focus all aspects of wood waste processing. Sevier Logging based out of Olympia, Wash., focuses on high production and safe practices. Lind Logging out of B.C. isn’t afraid to try something new, especially if it’s technology being developed by Cat. America Logger Council annual meeting review. The Wood Supply Research Institute (WSRI) is now accepting suggestions from members and others for research projects focused on improving the efficiency, productivity, profitability, or business relationships within the wood fiber supply chain. Be brief, consisting of three paragraphs with the first paragraph establishing background information for project consideration. The second paragraph should state expected project deliverables. The third paragraph should state how final project data might be used. Please submit your suggested research projects to the WSRI executive director, fendig@bellsouth.net, by January 15, 2015. WSRI is a joint project of professional loggers, forest landowners, wood consuming mills, educators, and manufacturers that facilitates and funds research to promote and improve efficiency in the wood supply system. The Forest Service Pacific Northwest Research Station recently published The Ecology and Management of Moist Mixed-Conifer Forests in Eastern Oregon and Washington: A Synthesis of the Relevant Biophysical Science and Implications for Future Land Management. The report reviews existing moist mixed-conifer (MMC) research across multiple natural resource issues. It also contains information on the current wood processing infrastructure and capacity for forest restoration and on biomass utilization. In August, Secretary of Agriculture Tom Vilsack released a report, The Rising Cost of Fire Operations: Effects on the Forest Service’s Non-Fire Work. The AFRC came out in support of this report. “This is an excellent recount of how the Forest Service has gone from a land management agency to a firefighting agency. One has to only look at this year’s fire season to realize that even though slightly over 3,000,000 acres were burned, the Forest Service spent its entire fire budget (42 percent of their total budget) on extinguishing their portions of those wildfires. Less forest treatments are taking place on the ground and the fires that are occurring are more catastrophic in size, severity, and cost. “The agency is out of balance on its priorities and focus on managing their forest lands. They have gone from the Forest Service to the Fire Service. Secretary Vilsack and his staff understand that something has to change to turn this trend around to once again let foresters manage the land rather than fire. View the full report at www.fs.fed.us/sites/default/files/media/2014/34/nr-firecostimpact-082014.pdf.